IMAS research into the recreational fishery for Southern Bluefin Tuna (SBT) is underpinning a new national program to recruit recreational fishers as ‘Tuna Champions’ to enhance stewardship of this iconic species. 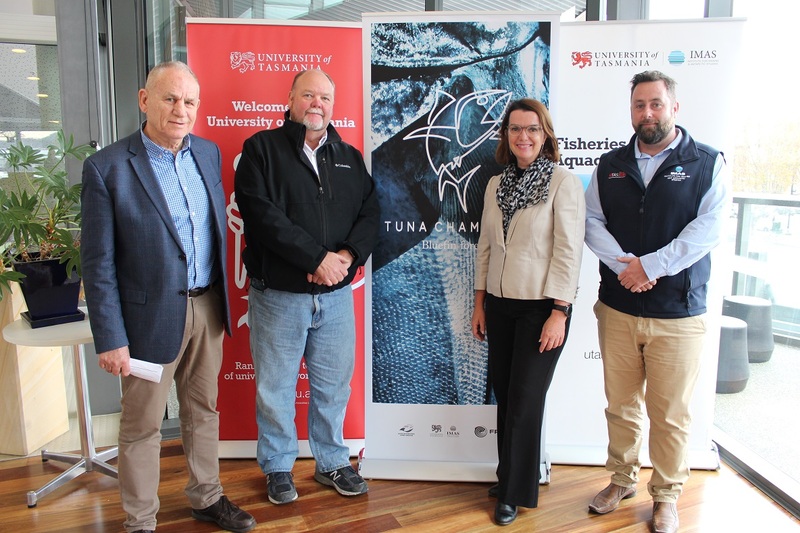 Launched in Hobart today, the Tuna Champions program is led by the Australian Recreational Fishing Foundation and IMAS, and funded by the Australian Government through the Fisheries Research and Development Corporation (FRDC). The program builds on previous IMAS research into the best handling practices for Southern Bluefin from ‘hooking to plate’. The Principal Investigator of IMAS’s recreational fishing tuna research, Dr Sean Tracey (Pictured, below), said recreational fishers could play a key role in helping to rebuild Southern Bluefin Tuna stocks. “The Tuna Champions program is informed by extensive research and aims to ensure Southern Bluefin Tuna continue to be a source of enjoyment and a high quality food product for fishers,” Dr Tracey said. “Our previous research showed that the survival rate of tuna caught and released by recreational fishers is greater than 80% if the fish are treated well. “We identified handling practices that can improve both the quality of retained fish and the survival rate of those that are released, and we developed a Code of Practice for SBT capture, handling and release. “Tuna Champions is the next step in this ongoing process, to ensure that the best practice fishing methods are broadly communicated to the recreational fishing community. “The program aims to ensure SBT are respected and valued, to encourage fishers to embrace the role they and their peers can play as stewards of the fishery, and to enlist them to actively contribute to our knowledge of the species. “By bringing scientists, government and recreational fishers together we can help to reduce wastage of harvested fish, improve meat quality, increase catch and release rates, maximise post-release survival rates, and improve estimates of the recreational harvest,” Dr Tracey said.